Roderick Dymott of IRATA International discusses established methods and proven solutions to achieve safety when working at height. As many delegates from around the world gather in Dusseldorf for the A+A event, most of those involved with work at height will be searching the aisles looking for new products or schemes that might enable them to perform with greater safety, or perhaps seeking someone who will do this for them. Those whose passion or career is based on mechanical solutions will promote or study various technical devices, watch demonstrations, look at new equipment and talk to individuals working with such devices. The issue being debated will be: ‘Is this product or procedure safe and can we see the evidence?’ And quite right too! But there remains only one access method being used globally for working at height or in confined spaces that can provide evidence of an exemplary safe working record across a quarter of a century. More than 25 years ago a particular access system was created to solve issues concerning work at height and access problems on one of the most complex worksites ever encountered - the offshore oil rig. The need to clean, inspect and repair such structures was a constant requirement, but traditional forms of high access, such as scaffolding, created more problems than they solved because their procedures required a static frame and considerable surface space to work from, and needed it to be dismantled and rebuilt as they moved around the platform. Moreover, when it came to creating such a frame to work beneath the deck, the effort needed even before the job could be started was considerable and the work limited by the size of framework created. The solution came in the form of cavers and climbers who were by that time using modern, slim ropes that were light and quick to set up. This was the perfect solution for the offshore industry and, in quick time, the major oil and gas companies recognised they had the ideal answer. Now men on ropes could not only access all areas of the rig above the main deck, including the cranes, but could also work below the main deck without the building of any access structure. Such work has now progressed to advanced and complex tasks within the legs of the platform and on the highest point of the main structure. While this was a turning point for the offshore industries around the world, it would not have come about had the industrial rope access method not have been safe, as well as more convenient. It was in these early days that the Industrial Rope Access Trade Association (IRATA) was created in order to provide training for this work and to guide the creation of relevant work procedures. Today, IRATA International operates in every continent, though it is now as likely to be seen at work in your local shopping centre or industrial sites and the great iconic buildings of the world. When the world came to see that a new means of working at height involved men of ropes there was widespread skepticism: surely the use of rope in construction and similar work would take us back to the dark ages? Perhaps the great structures of the past used men and ropes to create our fine historic architecture that is so loved today, but was that justification for inspecting and cleaning high and complex buildings using ropes? And were not workers operating at height much less able to move around the worksite if they were on ropes? And what happened if they slipped and fell, or were left suspended in mid air? At that point people were not as concerned as they should have been about the environment, though the heavy plant and invasive structures that were polluting our cities and hiding our architectural gems did little to endear themselves to the public. It was soon shown that men on ropes were infinitely more flexible in many situations within the urban environment, and priceless for work away from metalled streets, in confined spaces and in a vast range of other locations such as cliffs, power stations, fragile buildings, bridges and much, much more. Furthermore, we were now in a world that looked badly on pollution, blocked streets, noise and inconvenience, and that was drawn towards equipment that can be free of pollution and undue noise, does not disrupt traffic flow, and uses real manpower power to drive everything it needs. This was surely a world made for rope access - environmentally beneficial, convenient and effective, infinitely flexible - and it didn’t even need the Chairman’s parking space to store its access machinery. There were some, and even now there are a small number, who could just not get their head around using ropes to access and work on buildings of all shapes and sizes. IRATA, as the lead administrative body operating in rope access, created and has maintained a complete and thorough dedication to workplace safety. It is also of the view that a primary component in achieving high grade safe working is setting exceptional standards in training. From its first days IRATA has had within its membership sufficient companies to deliver the training required by the Association to ensure the rope access workers registered by it were fully qualified for the work they were required to do. IRATA is opposed to the view that training for work at height can be hurried, or that one brief course should be allowed to last a lifetime. It is simply wrong, however basic the work process, that a short tutorial, a cup of tea, and a quick ‘try out’ on the machine or equipment can be capable of preparing a worker and, in many cases, keep him ‘qualified’ for a career. The IRATA route is of thorough training and regular re-training, and the worker being assessed by an expert who is independent of the training company. Training is not something that can be rushed or short circuited and it must be tailored for the job to be done, not simply a test of physical fitness. Moreover, training must be based on the work the trainee is going to be involved with; it must cater for all circumstances the worker will encounter - in most cases it is essential that it is governed by a published curriculum, not written on the back of a cigarette packet! The safety statistics for the construction and access industries continue to cause concern and the primary causes of workplace incidents continue to be lack of the necessary skills, ignorance of the correct and safe procedures, and basic stupidity and carelessness. The evidence is that the worker who is well trained and has his ability regularly re-tested is unlikely to act dangerously on site. IRATA rope access does not require the worker to drive complex machinery or build an access structure, often to a considerable height. The ability to move up and down a rope by your own power is not especially tiring to the suitably trained individual, but the IRATA training programme is extensive - the basic course lasts one week - and additional training is not only required to move up through the grades, but also necessary to maintain an existing qualification. Furthermore, these technicians are not evaluated by the excellent and highly skilled instructors who teach them, as every course, wherever in the world it is held, is completed by the adjudication of an IRATA Assessor, not connected with the training company, who visits the course venue on the final day. 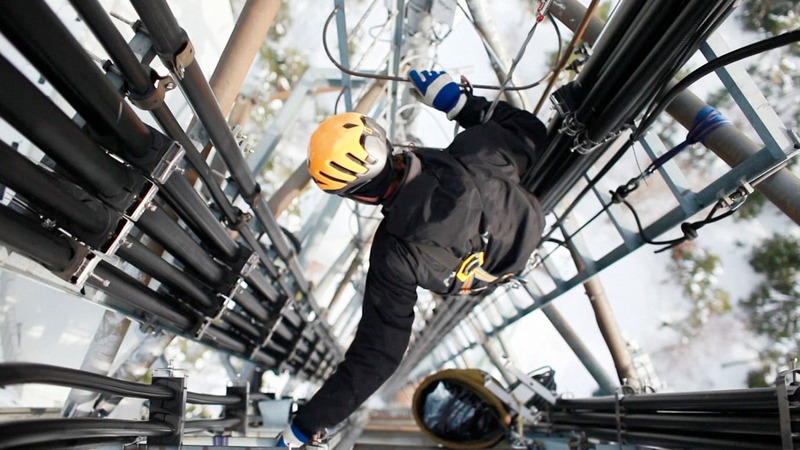 When training for work at height, whatever the skill level being sought, it is essential that the course is thorough, with all elements of the prescribed syllabus covered, is held in a situation that is as close to a work situation as possible, and is properly managed by someone with substantial relevant experience. That is the recipe for training excellence, but a once-over-lightly discussion at street level, or a few minutes on complex machinery, or a brief run through of ‘do’s and don’ts’ does not constitute adequate training and will not produce a safe worker. Rope access is a very simple procedure and only requires a decent physical condition, not the bodybuilding physique one might expect, and there is no substantial equipment to move into position. But the rope access worker is required to manoeuvre around a building with dexterity and effectiveness - even a ‘straight up and down’ job requires good rope skills. For this reason, IRATA insists on the re-training of every one of its many thousands of rope access workers on a regular basis throughout their career. Overkill? Money making training fees? No. Just a commitment to safe working that is demonstrated as effective by the annual,? independently compiled Work and Safety Analysis of the Association. It seems so simple, doesn’t it? And it is. Words such as ‘guesswork’, ‘assumption’, and especially ‘trial and error’ are not what one should hear on any worksite, especially one involving work at height. It is said the most common words in the written procedure for many industrial tasks are ‘as before’ or ‘follow previous job’, and the most likely result of that is accidents caused by the wrong assumption being made or a guess proving to be wrong. The International Code of Conduct that IRATA member companies work to was written by specialists who have encountered every possible work situation met by its work teams and, as a result, it answers questions before they become an issue. It is substantial guidance that operatives can to refer to when they want their first evaluation of a project to be confirmed, and is used by IRATA teams from Asia to Arizona, from Oz to Austria, and from China to Chingford. While the skilled IRATA worker will plan his work based on his experience and that of the rest of his team, the Code of Practice is there to show contractors and clients the extent to which IRATA rope access seeks to eliminate the errors that blight so many work sites. The work undertaken by IRATA is vast and wide ranging, from basic window cleaning and high or difficult inspection work, to attending to ranks of offshore wind farms, and oil and gas platforms, new build, extravagant high-rise buildings and ancient monuments. Its methods are applicable in almost every situation where height or access is a problem for other systems. The employer of work at height providers faces many problems, not least of which is that he is not often a practitioner or necessarily an expert in the subject. He will often rely on the sales pitches made to him, on published articles, trade practice, cost factors and on matters of convenience, timing and, one would hope, especially issues surrounding site organisation and safe working. I have heard of contracts being awarded by a pin being stuck in a directory of names, and of the method of work to be used selected because of the chosen company having their offices near a smart golf course - but one would hope this would be the exception. Along with costs, convenience and track records of performance, surely the evidence of the ability to work safely must always be considered? But that can be easier said than done. A bald man cannot claim to have a good head of hair, and car speed of 200mph cannot be quoted for a Robin Reliant - but safe work can be claimed by anyone; that is, until they are asked to prove it. A portfolio of work photographs can confirm experience - provided they are genuinely from the bidding company. Any number of membership certificates can be displayed and mean nothing if they have been purchased by means of a fee, or awarded because a simple audit has been passed. What you should require is genuine evidence - facts, not facetious claims, and not vague endorsements from unproven sources. If a service provider is making claims then you will need to validate them. If a good safety record is put forward, is it based on audited statistics, compiled by an independent source and created from years of records? If it is said that established work procedures are followed, then they must surely be written down, probably printed, and you should be able to study them. And, should this person claim membership of a trade association you have some knowledge of, has that been acquired by paying a fee, or by adhering to the rules of that group that has required a substantial audit that is repeated over time? And what about the workers? Is the company you are selecting able to produce evidence that these people are used to and capable of working to established work guidelines that exist in printed form, available for you to view? If these workers are qualified in some way, under some scheme, can that be proven and is that accreditation of high grade, and professional? Beware of potential charlatans - people perhaps being employed for work that they might be able to do at ground level, but have no work at height experience. A good number of visitors to A+A will, by now, be involved with the wind energy sector, and rope access is there with them. The techniques required to? inspect, clean and maintain a wind turbine - be it on land or at sea - represent a modest challenge to the rope access technician, since IRATA has been working on projects in testing conditions and involving confined spaces for 25 years. The deep sea oil and gas platform has regularly presented new and testing access issues, and rope access has solved them all. But even then, IRATA has demonstrated its commitment to responsible and safe work by creating its own guidance document* which covers all the procedures required to manage turbine work, and to do so safely. There were examples of such work being undertaken by untrained and ill-equipped workers in the recent past, but the wise have taken the route of correct and diligent methodology involving experienced workers. There is a reason for special safety guarantees when working at height. A few simple tasks may be able to be undertaken at height without substantial training, although the slightest error at height can be so much more serious than at ground level. Fundamentally, safe work at height comes from a workforce benefiting from extensive and career-long training, top grade site supervision always being at hand, experience with the means of access being used, reputable guidance - written and verbal - on work methods to be used, and an indelible commitment to the safety ethic. The famous sporting quotation from golfer Gary Player is: “The more I practice the luckier I get.”?Work at height needs to exclude any form of or requirement for luck. But the essence of Player’s comment is that if you take the training seriously, and train and practice every day, use good and relevant kit, follow the advice of your superiors and concentrate on the job in hand, you are likely to succeed. What kept Player at the top of his profession was attention to detail and being confident in what he was doing. By comparison, the word ‘competent’ seems almost lightweight, but it is a useful word to apply to the worker, his supervisors and managers, his training, his work procedures and his general career ethic, for if he ensures he is competent to undertake and complete every job of work he undertakes, he is more likely to remain safe and enjoy a long career. By means of competence you are likely to achieve safety. IRATA International has member companies and rope access technicians in every continent. It has six Regional Advisory Committees in primary markets. Copies of IRATA’s publications are available from the website and include IRATA International Code of Practice, and its annual Work and Safety Analysis. All IRATA member companies carry a Unique Membership Number that can be checked on the website; there are rope access companies who do not operate under the IRATA guidance or control.